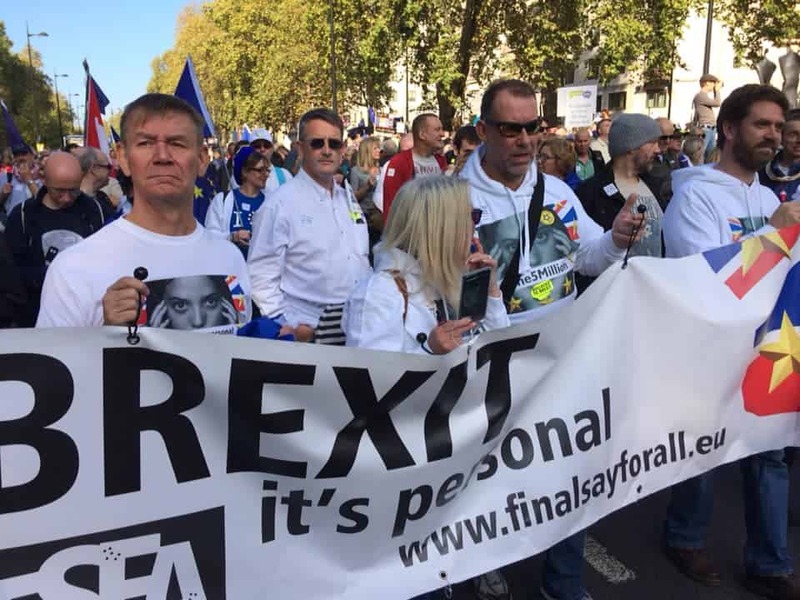 In what is set to be one of the biggest protests the country has seen, Brits from all over the UK and the world are set to march on Westminster tomorrow to ask the government for the people to have the final say on Brexit. Nearly three years on from the EU referendum of June 2016, the world is none the wiser about Britain’s future relationship with the EU and the other countries with EU trade deals across the globe. All we know is Britain is poorer and more divided than it would have been otherwise, and consecutive opinion polls suggest the tide has turned against Brexit, with more people than ever calling for the country to have the final say over choices politicians cannot make. When is the People’s Vote Protest? The march will start at 12pm on Saturday March 23 (tomorrow), winding towards Westminster Palace, outside which there will be speeches from 2pm onwards for around an hour. This weekend was meant to be the last chance for demonstrations before date set by Article 50 for the UK leave the EU on March 29. When is Brexit happening now? After Theresa May’s request for a short extension until June 30, the EU has agreed to delay Brexit for a short delay to Brexit until 22 May if MPs approve her withdrawal deal in a vote next week, otherwise the UK has until 12 April to set out its next steps. The EU said a further extension beyond 12 April is possible if the UK agrees to hold European Parliament elections on 23 May when the rest of the EU is. Britain can revoke Article 50 unilaterally and stop Brexit. An epetition for Parliament to debate revoking Article 50 has surpassed 3 million signatures in the past 48 hours. What is the point of the march? “We’re marching again from Park Lane to Parliament on Saturday because we won’t accept this broken Brexit being forced on us. We’re marching again with a simple demand that whatever happens now – whatever Brexit deal the political elite try to stitch up – they must put it the people. “We’re marching again with real hope because now there is a better chance than ever of winning this battle for us all to have the final say on Brexit. The Put it to the People March is going to be huge. “We know it will be loud. And, with your help, it can yet save the day. “On Thursday, the Prime Minister was in Brussels for last-ditch talks with European leaders. Next week, she may try again to force some sort of patched-up Brexit deal over the line. But on Saturday, in between those two dates, we will be marching down Whitehall, past Downing Street and on our way to Parliament Square. “There will be hundreds of thousands of us – young and old, rich and poor, from every corner of our great country – marching on a pivotal weekend. It promises to be one of the most important protests London has ever seen. There will be speeches from some of the biggest names in politics. “But this isn’t really about the powerful or the famous. “That’s because this mess can’t just be fixed inside Parliament’s gates, but by the force of people outside. Our case is a democratic argument: new facts mean a new vote. Now we know all those promises have been broken, now we know about the real costs of leaving, and now we know this broken Brexit guarantees no clarity about the future – just a crisis that goes on and on – it’s only fair to put any deal back to the people. What is the People’s Vote March route? The start point is North of the Hilton Hotel on Park Lane, Marble Arch station end. Marchers will proceed southwards down Park Lane on the East side of Hyde Park, turn left along Piccadilly, through Trafalgar Square , right onto St James’ Street, left onto Pall Mall, past Trafalgar Square, then right onto Whitehall, ending at Parliament Square. How do I get to the People’s Vote March? By London Underground, the nearest Tube stations to the start of the route are Marble Arch on the Central line or Bond Street, which is on the Central and Jubilee lines. Lancaster Gate, Edgeware Road, Bond Street, Paddington are all nearby too. For a shorter march from Trafalgar Square, the nearest accessible stations are Westminster on the Circle, District and Jubilee and Charing Cross on the Bakerloo and Northern. Other stations further down the march route are Hyde Park Corner, Piccadilly Circus, Charring Cross, Embankment, Waterloo, Westminster, St James’ Park, near where the march will finish. Leicester Square, Charing Cross, Westminster, Waterloo, St James’ Park, Vauxhall, Victoria. Coaches have been organised from around the UK tonight, with people arriving in the capital from all over tonight and tomorrow. Will it be bigger than Nigel Farage’s March To Leave? I think you know the answer to that. The last People’s Vote March last October was the largest demonstration by Brits since the protest against the Gulf War in 2003. An estimated 700,000 Brits from all over the UK, even ex-pats from around the world joined the march. Nigel Farage who has abandoned the March To Leave he began in Sunderland, told Radio 4’s Today programme when asked how many would be arriving in the capital on March 29 when Britain was due to leave the EU: “I don’t know. In spirit, I should think about 20 million right now. The accuracy of the former Ukip leader’s estimates have been called into question. "People's vote march got their numbers slightly wrong THIS IS AN OUTRAGE"
The march has been much satirised, appearing to have mustered a few dozen at most points. Some perhaps put off by Farage charging core marchers £50 to march by him in the drizzle.